Gefitinib, or IRESSATM as it is more commonly called, is an epidermal growth factor receptor tyrosine kinase inhibitor (EGFR-TKI). EGFR is part of the ERBB receptor family, which has four closely related members: EGFR (ERBB1), HER2 (ERBB2), HER3 (ERBB3) and HER4 (ERBB4). These receptors consist of an extracellular ligand-binding domain, a transmembrane domain and an intracellular tyrosine kinase domain. Ligand binding induces dimerization which activates the tyrosine kinase activity. This leads to receptor autophosphorylation and the initiation of signal transduction cascades involved in cell proliferation and survival. EGFR activation has been implicated in processes involved in tumor growth and progression including cell proliferation, inhibition of apoptosis, angiogenesis and metastasis. 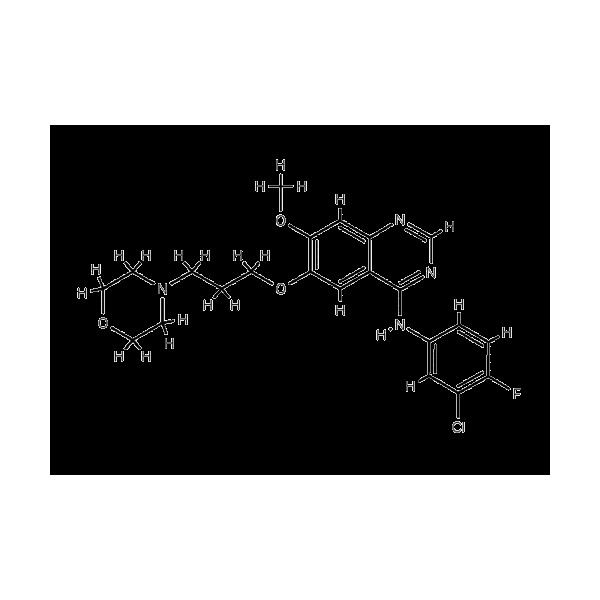 Gefitinib is an ATP competitive inhibitor of EGFR tyrosine kinaseactivity with an IC50 value of 0.033 µM (EGFR/HER1) and was shown to effectively inhibit HER1-HER2 heterodimers. HER2 (ErbB2) is inhibited with an IC50 > 3,7 µM. Gefitinib is widely investigated in non-small cancer of the lung, colon cancer, breast cancer and cancer of the head and neck. In non-small cell lung cancer recent data show its benefit to be limited mostly to adenocarcinoma subsets, patients carrying activating HER1-mutations, nonsmokers and patients of japanese origin. Gefitinib shows extensive tissue distribution. Its concentration in tumor tissue was shown to reach 16 µM which exceeds its HER1 IC50 by a factor of 500. Please notice: Gefitinib is subject to various Astra Zeneca patents and is intended for research use only. It might not be available in some countries and might not be available to some institutions. IRESSATM is a registered trade mark of Astra Zeneca. Blackledge G, Averbuch S (2004, review) "Gefitinib (\'Iressa\', ZD1839) and new epidermal growth factor receptor inhibitors" Br. J. Cancer 90(3):566-72. Ju JH, Oh S, Lee KM, Yang W, Nam KS, Moon HG, Noh DY, Kim CG, Park G, Park JB, Lee T, Arteaga CL, Shin l. (2015) "Cytokeratin19 induced by HER2/ERK binds and stabilizes HER2 on cell membranes." Cell Death Differ. 22(4):665-76. Petri MK, Brobeil A, Planz J, Bräuninger A, Gattenlöhner S, Nestler U, Stenzinger A, Paradowska A, Wimmer M. (2015) "PTPIP51 levels in glioblastoma cells depend on inhibition of the EGF-receptor. "J Neurooncol. 2015 May;123(1):15-25. Miao Wang1 and Alex Yuang-Chi Chang1 (2018) "Molecular mechanism of action and potential biomarkers of growth inhibition of synergistic combination of afatinib and dasatinib against gefitinib-resistant non-small cell lung cancer cells"